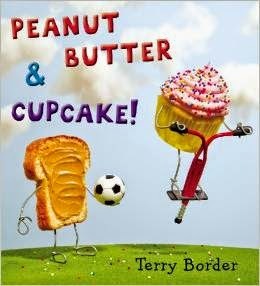 So I posted about buying Peanut Butter & Cupcake on my Five for Friday post last week and I posted a picture of it on Instagram and now I'm doing a post about it for Book Talk Tuesday with Mrs. Jump's Class!! I first found this book from another teacher posting about it. I think the post was on Instagram, but it was awhile ago so I can't remember who it was. I just remember thinking, "I must buy that book!" I recently ordered it and it just came in the other day. I cannot wait to read it to my students!! IT IS SUCH A CUTE BOOK! When it arrived in the mail, I immediately opened it and read it aloud to my husband!! Throughout the book Peanut Butter is looking for a friend, but there is always a reason he can't be friends with them. Do you think you can guess who Peanut Butter's friend should be?!?! I love the illustrations in this book. I could see so many activities with this book - writing a "how to" book for making peanut butter and jelly, teaching about friendship, or even writing/drawing a new story about "buddy foods." How fun would that be! I love children's books! Be sure to link-up if you have a great book to share!